Many of us diet, exercise, and generally try to maintain healthy lifestyles in order to achieve a flat and well-toned abdomen. Unfortunately, sometimes these methods alone are not enough to achieve our goals. An abdominoplasty (tummy tuck) or a partial abdominoplasty can be used to help you achieve the desirable firm, toned look that you want for your abdomen. What can an abdominoplasty or partial abdominoplasty do for me? 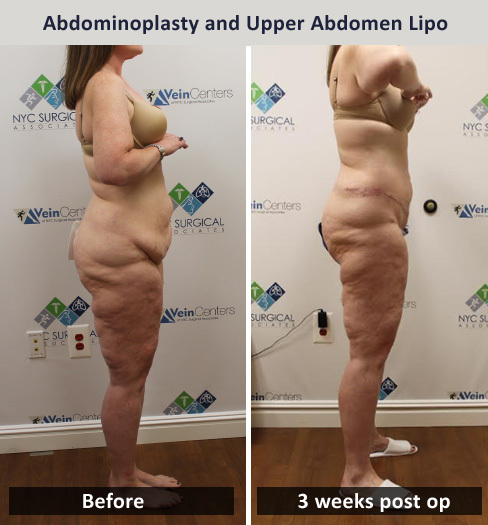 An abdominoplasty enhances the appearance of the abdomen by removing excess fat and skin and tightening the muscles for patients with pockets of fat or loose skin that have not responded to traditional diet and exercise. This includes those who have undergone weight loss surgery or women with stretched skin and muscles from pregnancy. Partial abdominoplasty, or “mini tummy tuck,” is similar to the regular tummy tuck procedure, except it involves a shorter incision and the skin is only lifted to the navel, which does not have to be moved. Am I a good candidate for an abdominoplasty or partial abdominoplasty? A tummy tuck is a major surgery, and therefore lots of care should be taken when making the decision to undergo the procedure. Educate yourself and schedule a consultation with an expert like Dr. Fiorillo. That said, women who have stretched muscles and skin from multiple pregnancies may find a tummy tuck useful in order to tighten those muscles and reduce the excess skin. An abdominoplasty can also be an alternative for men or women who were once obese and still have excessive fat deposits or loose skin in the abdominal region. Ideal candidates for a partial abdominoplasty are generally within 10% of their ideal body weight and include those patients who do not have enough excess fat and skin for a full abdominoplasty procedure, yet too much for liposuction alone. It is especially effective for those with a localized fullness within the lower abdomen that can be easily removed through the smaller incision. You can discuss the differences between these procedures, as well as weigh their benefits and risks with Dr. Fiorillo in order to decide which procedure is best for you. As with any type of plastic surgery procedure, it is also important for patients to be in good overall health and to have realistic expectations for their procedure. While abdominoplasty can significantly improve the appearance of the abdomen, it cannot be used as a means of major weight loss. Dr. Fiorillo will determine whether or not you are an ideal candidate for this procedure after a physical exam and detailed discussion of your goals for surgery. What will a tummy tuck or partial tummy tuck not do? It is critical to note that abdominoplasties are not substitutes for weight loss or proper exercise regimens. Also, tummy tucks (full or partial) cannot correct stretch marks, although these may be removed or slightly improved if they happen to be located on the same areas of excess skin that will be removed. How is a full abdominoplasty performed? This procedure is generally performed with the patient sedated, as it is a major surgery. In a full abdominoplasty, Dr. Fiorillo will make an incision from hip to hip just above the pubic area. Another incision is then made in order to free the navel from the surrounding skin. From there, the skin is detached from the abdominal wall to reveal the muscle and fascia. The muscle and fascia are then tightened with sutures. Depending on the amount of fat to be removed, liposuction may be used to refine the transition zones of the abdomen. A dressing and sometimes a compression garment are then applied, and excess fluid is drained. How is a partial abdominoplasty performed? This procedure is performed on an outpatient basis under either general anesthesia or local anesthesia with sedation, depending on the amount of fat and skin being removed, as well as the overall health and preference of the patient. During the procedure, Dr. Fiorillo will create a small incision above the pubic area, instead of the hip-to-hip incision needed for a full abdominoplasty. This procedure also eliminates the need for an incision around the navel. The skin is lifted up to the navel to remove localized fat and tighten muscles in the lower abdominal area. Depending on the amount of fat removal needed, liposuction may be used for a less invasive removal. The navel does not have to be repositioned with this less invasive procedure. The incisions are then closed with sutures, and small drains may be inserted to reduce the risk of fluid buildup in the area. The entire procedure usually takes one to two hours to perform, which is much shorter than a full abdominoplasty. What is the recovery from a full abdominoplasty like? Recovery depends on the problem treated, techniques used, and multiple other factors. The initial recovery period can take anywhere from one to four weeks and patients are advised to take at least part of this time off from work. Strenuous activity is discouraged and best avoided during the recovery period. Initially you may experience bruising and discomfort, and a compression garment or abdominal binder can minimize swelling and bruising. Full recovery can take up to six months, with scars fading more thereafter. What is the recovery from a partial abdominoplasty like? For a partial abdominoplasty procedure, patients can return home the same day after a few hours of monitoring. The recovery period is substantially shorter than that of a full abdominoplasty procedure. Compression garments will be needed to ensure proper healing for two to three weeks, although most patients will be able to return to work after a week or two. Heavy lifting and strenuous activity should be avoided for about a month. What are the possible risks of a full abdominoplasty? Abdominoplasties are generally considered to be safe procedures, however just as with any other type of surgery, certain complications can arise. Most of the risks can be avoided if patients carefully follow the instructions they receive from Dr. Fiorillo. Severe complications may occur in rare cases, including blood clots, thrombosis, cardiac and pulmonary complications or infection. What are the possible risks of a partial abdominoplasty? Although partial abdominoplasty is considered a safe procedure, there are certain risks associated with any type of surgery. Some of these risks may include infection, bleeding, blood clots and poor healing. Patients can reduce their risk of complications by choosing an experienced doctor like Dr. Fiorillo to perform their procedure and by following their doctor’s instructions before and after surgery.